The Great East Japan Earthquake Rebuilding Symposium, entitled ‘Exploring Integrative Approaches from Land to Sea’ was held on 5 August 2011 at the United Nations University headquarters in Tokyo. More than 200 participants, including representatives of local governments, private sector entrepreneurs, media professionals, researchers, and other interested parties listened to speeches and panel discussions from a wide range of Japanese and international experts and practitioners. This symposium explored ways to rebuild the damaged satoyama/satoumi communities using integrated approaches that focus specifically on land-sea linkages, while taking into account the deep-rooted challenges these communities were already facing, such as an aging population and lack of successors, in order to contribute to the long-term restoration and revitalisation of satoyama and satoumi. 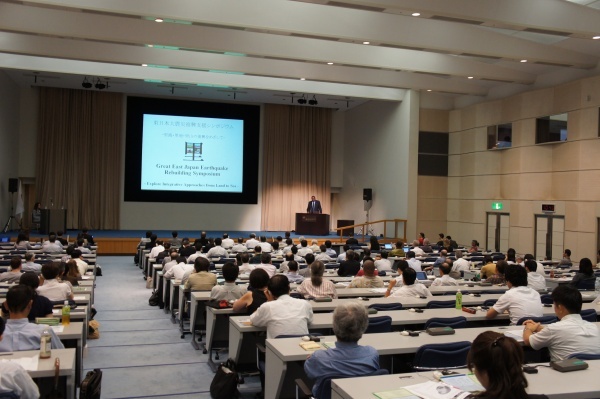 Following welcoming remarks and keynote addresses, two panel discussions were conducted on “Rebuilding Fisheries and Coastal Communities” and “Revitalizing Satoyama Landscapes”. The symposium was concluded with a wrap-up session and the presentation of key points related to the role of satoyama and satoumi in the ongoing rebuilding process. The agenda, and speakers profiles are now available for download.